Transporting your vessel from your home to the water and back again can be a bit of a nuisance if you don’t have the right gear to do it. Racking your kayaks or canoes up on the roof of your car and taking them off can often be a struggle, especially if you’re on your own, but that’s where a trailer can help. So what makes the best trailer for a kayak or canoe? We have looked at the main features of what makes a good trailer to give you a better idea of what you’ll need before you make your purchase. Before you purchase a kayak trailer you need to consider a few things. Probably the most important question will be to ask yourself how many boats you plan on putting on the trailer, and whether or not you want extra storage space for other items or gear? When you’re considering purchasing a trailer, you should think about where you will be storing it when it’s not in use. Some trailers come with some parts that can be folded, allowing you to store them in smaller spaces in your garage. It’s also a good idea to measure your available storage space to make sure the trailer you’re planning on purchasing doesn’t exceed those dimensions. A lot of yak trailers are made with steel, and this is a good material to choose. It is durable and strong and will wear well. You will probably find that most will have a galvanized coating that will give them extra protection against corrosion and rust, and these are particularly ideal for saltwater environments. An important feature of a kayak trailer is that it is easy to move. A good trailer will be one that you are able to move by hand, even when it’s fully loaded with all your yaks and gear. A lightweight frame will be easier to maneuver. Some yaks will come with suspension systems and this can be important for giving your vessels a smooth ride, especially over bumpy roads. A trailer with suspension will be able to travel over rougher terrain than one without, but if you’re traveling mostly over paved roads your trailer may not require suspension. If you’re planning on traveling off-road to find the best paddling zones, you will probably want one with suspension to prevent it and your yaks from bouncing too much. 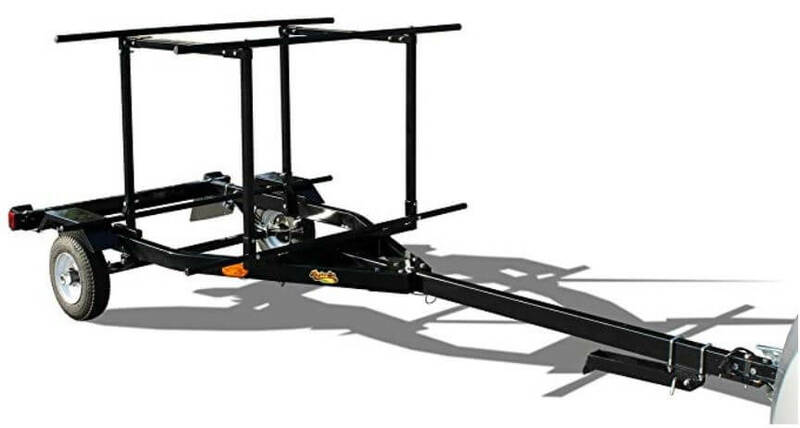 Tongue length, which is the distance between the axle and the hitch, will be an important factor when choosing your trailer because it is this that will determine the length of kayak you can carry as well as determining how easy it will be to tow. The shorter the tongue length the less chance there is of being able to carry longer yaks and the more difficult it will be to back up in a straight line. The longer the tongue length the less likely it will be that you will jackknife and the easier it will be to travel straight when you’re moving backwards. You may be tempted to choose a trailer that has smaller wheels as it may seem like it would be easier to load and unload your craft from a lower platform. However, while this may be the case, you will need to consider that smaller wheels will mean your tires will wear out more quickly. Smaller wheels will have to do more rotations in order to cover the same distance as that of a larger wheel, simply because it’s smaller, so your trailer could end up costing you more in the long run. Smaller tires can also be more difficult to purchase. If you’re looking for a trailer for your tandem yak, the main things to consider are its maximum weight capacity and whether or not it can carry a vessel of your length. Many trailers will have the capacity for carrying tandems, with some being able to extend to accommodate longer length boats. Tandem yaks may tend to be wider than those designed for one paddler, which means you will need to look for a trailer that is designed to handle wider vessels, particularly if you’re looking to tow more than one tandem. 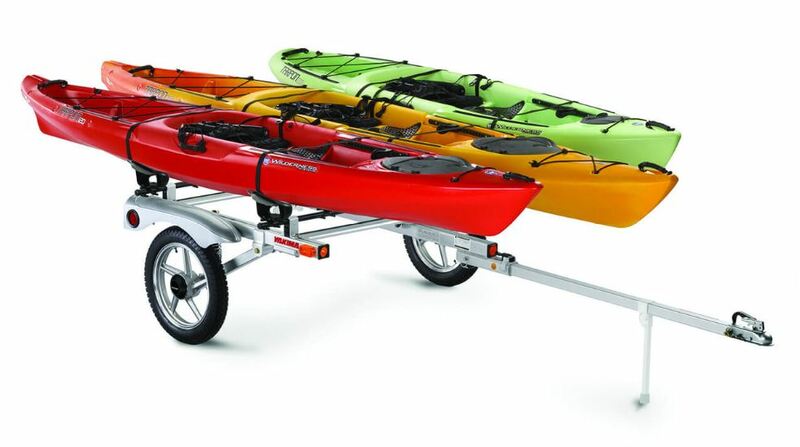 Multi kayak trailers are a convenient way of transporting a few yaks at the same time, which can be ideal for families who love to paddle, or groups of paddlers traveling together. For these, you would need to consider the maximum weight capacity of the trailer and whether it’s designed to carry varying lengths and widths of vessels. Multi-yak trailers can carry SUPs and often bikes as well as kayaks and canoes. However, they tend to be more expensive, but can offer good value if they are being used to tow multiple vessels each time they are used. This one from Ruff-Sport measures 11 and ½ feet long and 64 inches wide. It is designed to carry up to two yaks plus two bicycles and can also be configured to carry SUPs and surfboards, so could be a good choice if you participate in a lot of watersports. The trailer has large 12 inch wheels, with springs to reduce vibration, and the frame is made from galvanized steel, meaning it’s strong and durable, not to mention being well suited to saltwater environments. It takes a little bit of time to assemble and it does not come with padded crossbars, but they can be purchased separately. It does, however, have locking tongue that folds up, as well as submersible LED lights. If you’re looking to transport up to 4 yaks, this one from MicroSport could be a good choice. It boasts being able to be easily assembled, with clear instructions, and features a galvanized steel frame for added strength and corrosion resistance. It has a weight capacity of 355 pounds and can carry vessels that are up to 20 feet long, so most yaks and canoes will be able to fit on this one comfortably. It is 65 inches wide and its total length is 159 inches, including the 8 foot tongue, and it benefits from having 12 inch galvanized wheels with marine grade bearings. The 65 inch wide crossbars make it compatible with most car rack accessories and it also comes with a pre-wired electrical system for lights. The XtraLight package could be a good choice if you have a recreational or fishing yak. It can carry up to two yaks at once and can accommodate yaks that are up to 32 inches wide and 14 feet long, so most recreational yaks will fit on this trailer. With a weight capacity of 275 pounds, this one will be able to handle even the most rigged fishing yak. It’s made in the USA with a marine grade galvanized steel frame and galvanized axles with leaf spring suspension. The trailer measures 134 inches in length and is 58 inches wide, with a two piece reinforced extended tongue. The package comes complete with 4 padded V-racks for safely holding your yaks as well as 12 foot loading straps and mounting hardware, so it can be a good choice if you’re new to the sport. This MicroSport trailer package could be a good choice for longer vessels and for those looking for a trailer that is complete with everything you need to be ready to load. This one can hold up to two yaks of up to 20 feet long, with a load capacity of 355 pounds. It measures 159 inches long and 65 inches wide, with 65 inch rectangular crossbars that are compatible with many car rack accessories. Another feature is its galvanized steel frame, giving it durability in a range of conditions. It also benefits from 12 inch galvanized wheels and comes with a handy spare tire with a locking attachment. The package includes two sets of two SeaWing carriers, that are padded and wide to help give your craft more protection when you’re on the road. It also comes with the mounting hardware and the tie down straps, so you’ll be ready to load as soon as it’s assembled. With this trailer you can transport up to four vessels of up to 19 feet at the same time. Made from marine grade pre-galvanized steel, it measures 164 inches long and 78 inches wide and also has durable, galvanized wheels. The 78 inch steel crossbar is coated for added durability and is designed to fit most car rack accessories and the trailer has a load capacity of 350 pounds. The package features four sets of J-Pro 2 yak carriers, which feature a protective foam covering and a corrosion resistant frame. The carriers are designed to fit most sit-inside and sit-on-top yaks. The package also conveniently includes a spare tire, for those emergency situations, as well as tie down straps and other hardware, so if this is your first trailer you will have everything you need to get your yaks out on the road to get to the water as soon as possible. With the Yakima Rack and Roll trailer you could potentially carry up to six lightweight kayaks if you use J cradle style racks, as long as the maximum weight doesn’t exceed 250 pounds. With the additional purchase of Heavy Duty Shock springs the trailer can hold up to 350 pounds. The trailer features 78 inch crossbars that are compatible with Yakima accessories and can hold bikes and roof top boxes, as well as canoes. It’s a lightweight aluminum trailer that measures 132 inches long and features LED lights for safety as well as lockable levers to prevent theft. It also features a carrying handle so you can pull it by hand, which can make it easier to haul your yaks closer to the water. If you’re looking to carry several kayaks at once, this Right-On Multi-Sport trailer could be a good choice. It features a two tiered rack system that can let you carry multiple kayaks on both the top and the bottom, as long as the load is under 300 pounds. Its multi-sport design means you can also carry other equipment, such as bikes, SUPs or canoes, so it could be a good choice for family trips or camping vacations, as it can also hold roof top cargo boxes to give you additional storage space. The 64 inch crossbars are round and are designed to be compatible with a range of accessories from other brands, including Yakima and Thule. For safety on the road, the trailer also has rear lights. Now that you have seen some of the products that are available you will probably have a better idea of what you might be looking for in a trailer. Just keep in mind where you plan to use it, such as the type of terrain or whether it’s over long distances, as this may affect the size of wheels you will need. Also, consider how often you’ll be trailing multiple yaks to and from the water. If you will mostly be paddling on your own, a trailer than can carry up to two vessels might suit you more than a larger one and will also likely be less expensive. You will have noticed that you can also use the trailers to carry other items and gear, such as bikes and boards, so it can be useful to think of other ways you could use yours. If you have enjoyed discovering some of the best yak trailers on the market then please let us know by leaving a comment, or likewise if you have any questions for us. And don’t forget, you can always share this with your fellow paddlers and watersports enthusiasts.